These military land warrants were not actually issued to these soldiers until decades after the war. My ancestor, James Dane, served in Capt. Adam Vickery's Company in the 15th Regiment of Kentucky Militia. James was just a private and finished his service in 1815. However, he received his 80 acres out in Missouri in the year of 1853. This is almost 40 years later and James was then 75 years old. Because James is older and settled in Kentucky at the time, he ends up giving the land to his grandson. Finding this War of 1812 record helped me understand why some family left Kentucky and then settled in Missouri. His grandson ends up raising a large family on that piece of military land and many of those direct descendants are still there in Missouri today. This same land document will list the actual unit your ancestor served in during the War of 1812. Also, keep in mind that my ancestor was just a private during the war. If your ancestor was an officer, they would receive many more acres according to rank. These land records will have the current U.S. president's actual signature at the bottom of the document. You will easily find one of the signatures of either Franklin Pierce, James Buchanan, Woodrow Wilson or a few others. In addition, the land web site will have an extra tab that you click on and displays a colored map of your ancestor's land. The actual land will be marked by an exact red line outline of the military land in the county and state where issued. If your ancestor sold the land, the document will list the person that bought it. You will notice a little "W" or a "P" by the persons named on the web site. The W stands for the Warrantee (the person who was awarded the land) and the P stands for the Patentee ( the person who bought the land from the Warrantee). Some men were lucky to get their War of 1812 military land much quicker but there was a land shortage. The Scrip Warrant Act of 1850 created a new opportunity for men who served in the military before 1815 to get reimbursed for their effort. Some men just sold their Scrip for cash but many turned in the Scrip for land. Also, depending on what state your ancestor served in during the War of 1812, made it easier or more difficult to get their due military land. My ancestor, James Dane (had been Dean), served in Kentucky and lived in Wayne County. When the Scrip Warrant Act passed on September 28, 1850, James had to go to court to prove that he indeed was a soldier(almost 40 years later). Several men from his old unit, including his Capt. Adam Vickery, appeared in Wayne County Court on March 1, 1851. The men proved they had served in the war and justice prevailed. It must have been quite a scene in the court house with these old war buddies coming together again. 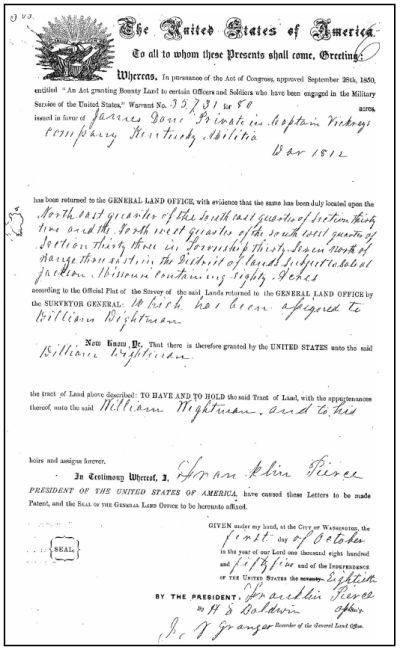 If you are really lucky in your search, you may find pension records from this War of 1812 that relate to your ancestor. These can be found at the National Archives at www.archives.gov. As you may know, pension records are filled with family history, family names and birth dates, marriage dates, family friends and military history of ancestors. However, finding military records of any kind help to tell an important story about your ancestor. Keep in mind, the male ancestors in your family tree would be born approximately between 1770- 1796 to be of age to serve in the War of 1812. If you did not know if they served or not, you would still have fun entering their name on the search page to see if there is any match at all. Down the road, you may be able to complete your ancestor's military story. The Muster Rolls give you a story about the battles your ancestor served in, month to month records of where they were, how much they were paid, if they were sick, injured or killed. You can access these completely free of charge and print off copies for free as well. For me, these land records helped me figure out why family members left Kentucky and went to Missouri. These records let me know that my ancestor completed his duty to our country and it is signed by President Franklin Pierce. Like me, you may feel compelled to frame this piece of important family history from 1812 and get it on your wall.